Organic Silver, 14 Karat Rose Gold, and 17.37 CT Rough Cut Pink Tourmaline Unisex Ring, accented with 1.28 CT Pink and White Diamonds and Hand Engraving. This ring is truly one of a kind and is ready to be worn by someone who appreciates its beauty and intricacy. Known for its emotional and spiritual healing properties, tourmaline can be found in a remarkable range of colors, but pink/red stones are one of the most sought after varieties of tourmaline. This particular stone has a rustic, unpolished look that is rarely found in modern day By keeping the stone as close to its natural state as possible, this ring is transformed in a unique work of art worthy of a special collection. The rose gold cross encrusted with pink diamonds and framed in an arc of white diamonds creates an antique look that dominated jewelry design for centuries. This ring also features Organic Silver - silver that does not contain any added alloys that could compromise the strength or quality of the piece. When asked why he prefers Organic Silver to "regular" silver, Michael says, "it is a form of environmental conservation - we save the planet while creating wearable works of art." Centuries of legends and folklore refer to tourmaline as a "receptive stone," with powers to soothe, calm, and promote communication between the conscious and unconscious mind. Legend says that it was often worn with the hopes that it would help its wearer foster compassion and stability. 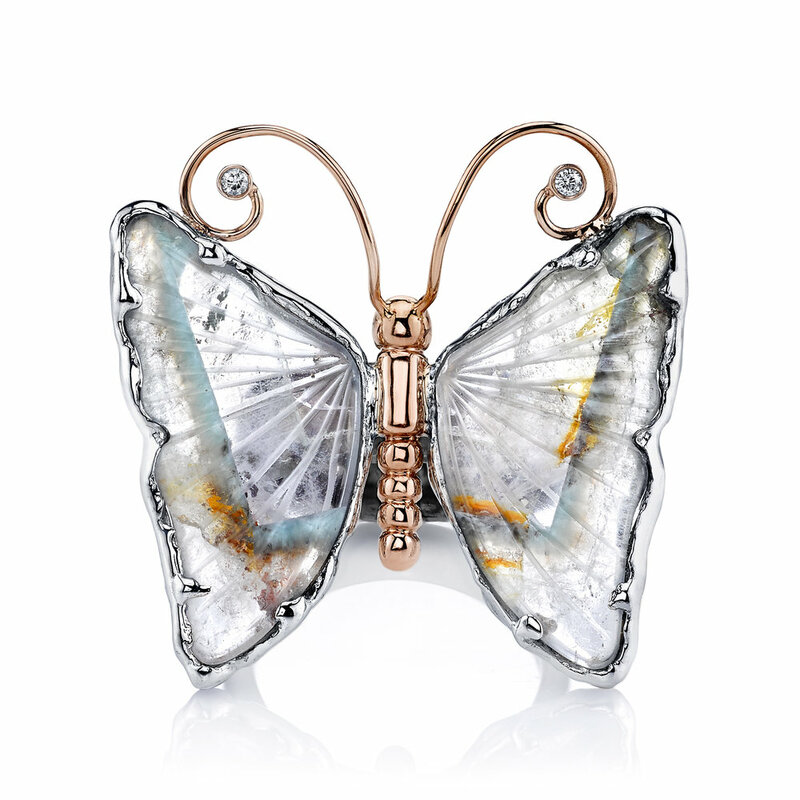 Butterflies convey a sense of lightness and joy, reminding us to enjoy life's simple pleasures. Organic Silver is "the purest form of silver without added alloys." When asked why he prefers Organic Silver to "regular" silver, Michael says, "it is a form of environmental Organic Silver and 18 Rose and White Gold Butterfly Ring, made with a 31.50ct Tourmaline Slices, and accented with .07ct diamonds. This ring is currently a size 7 and can be sized three sizes up and three sizes down. What exactly is a butterfly sizer? Let us explain. The innovative and creative individual that he is, Michael Barin came up with a solution to size down very intricate rings and accommodate women with large knuckles. By inserting flexible wings to the inside of the band, he achieved a more comfortable fit for rings that are difficult to slide on, but need to stay securely in place. Women with arthritic hands will be happy to know that the butterfly sizer will allow them to remove rings without any difficulties – the wings open to allow the wearer to slip off the ring and later put it back on again with the same ease. In just over a few decades, the Paraíba Tourmaline has become one of the rarest and most sought-after gems in the world. Originally discovered in 1989 in the state of Paraíba, Brazil, these vivid stones have a bright glow incomparable to most gems. This copper and manganese bearing Tourmaline comes in shades ranging from brilliant turquoise to stunning blue-green. Although members of this gemstone family technically come in all colors of the rainbow, the Paraíba’s rarity is undeniable – for every 10,000 diamonds mined, there is only one Paraíba Tourmaline. A recent twist in history makes this remarkable gemstone even more intriguing. In 2003, a new wave of vivid turquoise, copper-bearing Tourmalines entered the market. These stones were mined by hand in the copper-rich mountains of Mozambique and Nigeria in Africa. With only minute chemical differences from the stones unearthed in Brazil, these new Paraíba-like Tourmalines are often found weighing five carats or more. If we think about the geographical location of these two varieties of Tourmaline, it brings us to a very interesting observation – at some point, the copper-rich mountains of Brazil must have been a lot closer to the copper-rich mountains of Mozambique and Nigeria. Keeping in mind that the continent of South America and the coast of Africa appear to fit together like puzzle pieces, it is very possible that these two landmasses were connected a long time ago and have slowly crept away from each other as a result of continental drift. Fact or fiction? We can’t be sure. This story only adds to the allure of the beautiful Paraíba Tourmaline, making its wearer part of a very intriguing mystery. Michael Barin’s Paraíba collection boast a design with a 7.74 carat Paraíba-like Tourmaline set in 18 Karat White Gold and accented with Diamonds. This particular stone displays a rutilated copper pattern, lighting the stone from within.